Cassava (Manihot esculenta Crantz) is a shrub grown in the tropics and subtropics for its underground starchy tuberous roots. Cassava roots, also called cassava tubers, are a major staple food for more than 800 million people in the world (Ecocrop, 2011; Lebot, 2009). Cassava tubers can be eaten boiled, mashed, deep-fried, etc. and there are many food products based on cassava, such as tapioca (cassava starch), a worldwide food ingredient, fufu (cassava flour boiled in water) and garri (fermented cassava mash), the two last popular foods in West and Central Africa. 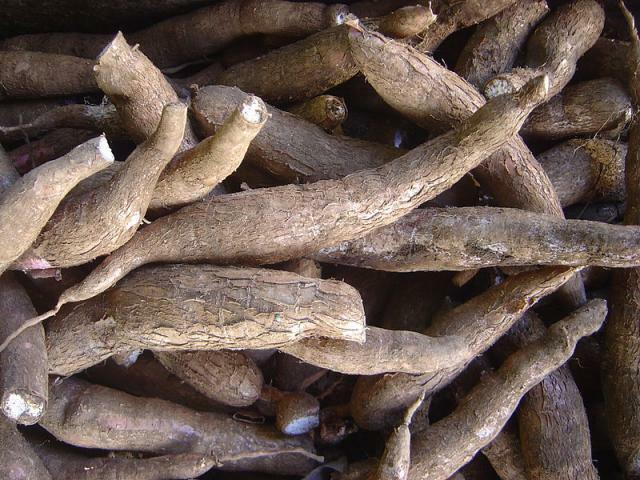 Cassava tubers also provide starch for ethanol production (Kuiper et al., 2007). Other cassava products include the finger-like leaves, which are consumed as vegetables or used as feed (see the Cassava foliage datasheet) and numerous by-products (notably pomace and peels) of the cassava processing industries (from starch, ethanol and cassava food production, etc. ), which are also potential feeds (see the Cassava by-products datasheet). Cassava flour unsuitable for human consumption is also recycled as animal feed (Boscolo et al., 2002a). Cassava pellets: ground and pelletized cassava chips. Hard pellets are particularly compact industrial pellets. A native to South America, cassava is now widespread throughout the tropics and subtropics, including Sub-Saharan Africa and South-East Asia. The main production areas are within 30°N and 30°S and from sea level to an altitude of 2000 m, depending on the latitude (Ecoport, 2009). Optimal growth conditions are an annual average day-temperature over 18-20°C, annual rainfall ranging from 500 mm to 3500 mm, high solar radiation and light, well-drained and acid soils. Cassava may withstand light frosts at higher altitudes and cloudy conditions in the hot humid lowland equatorial belt. A hardy plant, cassava is highly tolerant to poor soil conditions, drought and pests (Vongsamphanh et al., 2004), but it does not grow well in heavy, rocky and gravelly soils. It is susceptible to waterlogged, saline and alkaline soils. Zinc deficiency should be avoided while very low P levels are well accepted. Cassava root production has been increasing steadily since the 1960s and has surged since 2000 (increased 40% between 1997 and 2007, from 161 to 224 million tons). Its use in animal feeding has also increased from 25% of the crop in 1997 to 34% in 2007 (76 million tons). In 2010, 52% of cassava was produced in Africa, 33% in Asia and 15% in Latin America (FAO, 2011). The production of cassava chips and pellets for animal feeding started in Thailand in the 1960s, fuelled by European demand for energy sources cheaper than cereal grains, which were then highly subsidized in the EU. Shipping expenses and European concerns about dust pollution motivated a shift from chips to pellets in the late 1960s and to hard pellets in the early 1980s. Cassava exports to Europe climbed until the mid-1980s (the Netherlands imported 45-50% of worldwide dried cassava), when the EU set importation quotas (FAO, 2001a). The European market gradually evaporated and was replaced in the mid-2000s by China, which now imports 85% of the dried cassava produced worldwide. Today, Thailand remains the major exporter of dried cassava (80% in 2009), far ahead of Vietnam (14%) (FAO, 2011). Fresh cassava tubers, particularly high-quality ones, are very perishable. They deteriorate within two or three days of harvest and therefore must be processed quickly (Müller et al., 1975; Tewe, 1992). Tubers intended for industrial animal feeding are sliced and dried, and then usually ground or pelletized. The technologies used at different scales of chip and pellet production are similar and cassava chips can be produced by simple techniques in the household or village as well as on a large mechanized scale. The selection of a technology depends on the amount of cassava to be processed, the availability of capital and labor cost, as well as the availability of relatively cheap energy (Hahn et al., 1992). The first step is usually washing, followed by peeling. The roots are then sliced, either by hand or mechanically. Cassava chips may have different sizes and shapes, rectangular, cubic, thick sliced, depending on the slicing and drying methods. Drying may be natural or artificial. Sun-drying is done on concrete floors or on trays. Sun-drying is a very labor intensive operation, requiring about 35-40 laborers per hectare of drying floor. Chips dried on trays look better and are more uniformly dried than those dried on concrete floors. Artificial drying is done using static or moving bed dryers, or rotary dryers. Cassava chips can be sold directly, ground into cassava meal, or pelletized. During pelletizing, chips are heated and moistened and then forced into continuous die presses. Pelletizing results in a product that is 25-40% denser, more uniform, more durable, less dusty and easier to handle (Hahn et al., 1992). Because peeling operations require time, alternative methods to produce chips and pellets without peeling have been developed. One such method consists in grating and chopping unpeeled tubers, mixing them with cassava foliage in a 4:1 ratio and passing the mixture through a pelletizer (Tewe, 2004). In humid places where sun-drying is not easy, cassava roots can be ensiled alone (clean cassava roots + 0.5% salt) or mixed with rice straw or cassava leaves (Le Duc Ngoan et al., 2002; Premkumar et al., 2001; Kavana et al., 2005). Cassava is generally propagated by stem cuttings. However, under natural conditions as well as in plant breeding, propagation by seed is common and farmers in Africa are known to occasionally use spontaneous seedlings for subsequent planting (Lokko et al., 2007). Starch accumulation within the tubers occurs some 180-200 days after planting when they begin to thicken and store large quantities of starch. Because older tubers have the highest starch content, the best harvest period ranges from 9 to 24 months after planting. Cassava roots for animal feeding are commonly harvested from the 9th to the 12th month after planting (Kuiper et al., 2007; Régnier, 2011; Gomez, 1991). Harvesting is the most expensive part of cassava production. In order to improve tuber preservation, stems and leaves are cut two weeks before harvesting, leaving only a few centimetres of stems above ground. Uprooting must be done carefully because damaged tubers spoil readily (Kuiper et al., 2007). In 2009, the average worldwide tuber yield was 13 t/ha (FAO, 2011). Most cassava is produced by smallholder farmers living in marginal and fragile environments, and particularly on erosion-prone, acid and infertile soils. This ability to produce on poor soils, where most other crops would fail, has given cassava a reputation as a safeguard against food scarcity. However, there are serious environmental concerns about cassava production (FAO, 2001b). For the environmental impact of cassava processing, see the Cassava by-products datasheet. Cassava production can be detrimental to soil fertility through crop removal of nutrients. Due to the low value of cassava products, the application of manure and chemical fertilizers, which could easily correct nutrient depletion, may not be economically justified or affordable for smallholders. However, it should be noted that, at current yield levels, soil nutrient depletion by cassava is lower than depletion caused by other crops (FAO, 2001b). Cassava production can result in serious erosion when the crop is grown on slopes or on light soils. Good agronomic practices (adequate fertilizer, closer plant spacing, planting on contour ridges, intercropping, reduced tillage), used alone or in combination, can reduce erosion by 50-90%. Properly managed cassava production on slopes does not necessarily cause erosion (FAO, 2001b). It is considered unlikely that cassava production results in water pollution, as it is grown mainly by poor farmers who apply no or very low rates of fertilizers, pesticides and herbicides. However, this may change in the future (FAO, 2001b). Cassava production does not seem to have had widespread effects on biodiversity, though some local situations may merit attention, such as deforestation in the north-east of Thailand or the competition with native cassava species in Latin America (FAO, 2001b). Cassava roots contain a large amount of starch, ranging from 70 to 85% DM, which increases with the stage of harvesting (Régnier, 2011; Ly, 1998). Cassava roots are therefore considered as an energy feed. However, their protein content (typically < 3%) is lower than that of cereal grains. Cassava can be substituted for cereals at high level in rations for all classes of livestock and poultry, provided that it is supplemented with a nitrogen source. The fibre content is also extremely low (NDF < 10% DM), which makes cassava roots highly digestible in all livestock species. HCN content may or may not be a problem, depending on the variety, process and livestock species. Bitter varieties have roots containing 0.02-0.03% HCN (DM basis) and fresh leaves containing up to 0.2% HCN (DM basis) (Murugesrawi et al., 2006). Values up to 0.22% DM have been reported in fresh roots (Smith, 1988). These varieties have to be processed before being fed to animals. Sweet varieties have roots containing less than 0.01% HCN and fresh leaves containing about 0.1% HCN (DM basis)(Murugesrawi et al., 2006). These varieties can be fed raw. Most commercial varieties belong to this group. Bitter varieties often have longer and thicker roots than the sweet varieties, but there is no simple and safe method to assess HCN content. Intensive use of cassava in animal feeding is possible after removal of the cyanogenic glucosides. It is generally assumed that roots containing less than 0.01% (100 mg/kg) of HCN in the DM are safe for use in animal diets (Buitrago et al., 2002b). Hydrogen cyanide is easily destroyed by simple treatments and many detoxification processes have been tested. Drying or ensiling cassava roots are the main processes for detoxification and storage (Gomez et al., 1988b; Tewe, 1992). In South America, ground cassava roots are put in nets, and then washed and squeezed until the toxic substance is eliminated. The toxic elements can also be removed by cooking, or by drying slices of the roots for about two weeks. Sun-drying appeared to be more efficient than oven-drying (60°C) (Panigrahi et al., 1992; Tewe, 1992). The presence of HCN makes cassava products insect-resistant and easy to store. Adding 15% cassava root meal to a concentrate feed also improves its resistance to pests (Göhl, 1982). Both fresh and dried cassava roots are consumed by ruminants in different forms (chips, ground, pelleted). Cassava starch has a large amylopectin content (70%) making it a suitable energy source for ruminants when combined with non-protein nitrogen in feeds (Müller, 1977). The use of fresh cassava roots of bitter varieties is limited by their HCN content. When properly processed, they may serve as a basic energy source for intensive cattle feeding (Müller et al., 1975). Dried cassava roots have given satisfactory results as the principal energy source in ruminant production systems (Göhl, 1982). Studies indicate that the inclusion of cassava, to partly replace cereal grains (maize, barley, sorghum) up to 30-40%, gave satisfactory animal performance with no negative effects on animal heath in finishing beef and dairy cattle, growing goats and lambs (Chanjula et al., 2007; Wachirapakorn et al., 2001; Sommart et al., 2000; Holzer et al., 1997; Zinn et al., 1991; Göhl, 1982). When cassava tubers are supplemented with non-protein nitrogen, minerals, vitamins, and roughage, high performances have been registered with dairy and beef cattle, sheep and goats (Smith, 1988). Palatability can be enhanced by the addition of molasses if pelleting is not possible (Göhl, 1982). The energy value of cassava roots is about 85-93% that of maize grain, depending on the quality and starch content of the roots (Sauvant et al., 2004). In beef cattle, dried cassava was found to be as digestible as steam-flaked maize, but more so than sorghum grain (Zinn et al., 1991; Holzer et al., 1997). Because of the rapid degradation of cassava starch in the rumen, split-feeding several times a day can help ensure efficient utilization of nitrogen-deficient basal feed (Smith, 1988). In some experiments, replacing maize with cassava resulted in lower milk yields but also in lower production costs. However, milk yield increased in other feed trials. Using cassava as an energy supplement in grazing cows had a positive effect on milk yield (+20%). Supplementing a fresh or ensiled sugarcane-based diet with cassava did not change milk production (Smith, 1988). In beef cattle, including cassava pellets up to 65% of the DM does not seem to affect health, carcass quality or overall performance when the diets are carefully balanced (Göhl, 1982). There were no significant differences in the performance of Holstein-Friesian male calves (180 kg live weight) fed a mixed diet containing 80% concentrate when 40% of the grain was replaced by cassava, except for a small increase in DM intake. The average daily gain was 1200 g and the energy conversion efficiency into live weight was reduced by 8%, depending on the nature of the protein source (Holzer et al., 1997). Substitution of maize cobs with cassava (20%) in sheep fed pangola grass (Digitaria eriantha) hay improved digestibility, body weight gain, and rumen function (Smith, 1988). Supplementation by 20 to 80% increased the digestibility of a rice straw-based diet but reduced the digestibility of a molasses-urea-based diet (Devendra, 1977). In goats, replacing maize grain by cassava roots reduced performance at substitution levels of 40% and 60% (Smith, 1988). Supplementation of Gliricidia sepium with cassava roots at 30 g DM/kg W0.75 reduced growth rate (Smith, 1988). Improved digestibility and similar growth rate to a control diet were reported with a 75:25 Gliricidia/Leucaena mix supplemented with cassava roots at 15 or 30 g DM/kg W0.75. This discrepancy between the two last studies was attributed to energy-nitrogen synchronization in the rumen (Smith, 1988). Due to their high starch content, cassava roots are an excellent source of energy for pigs and can be used in fresh, ensiled or dried forms (Göhl, 1982). The digestible energy value of dried cassava roots for pigs varies between 14.5 and 16.5 MJ/kg DM (Sauvant et al., 2004; Rostagno et al., 2005; Régnier, 2011). These variations can be attributed to differences in chemical composition, especially in the starch and fibre fractions (Régnier, 2011). Because cassava peels are more than twice as fibrous as the root pulp, peeling improves energy digestibility and energy content. For growing-finishing pigs, it is possible to include up to 60% of dried cassava root in the diet. The inclusion rate depends on the growth stage of the pig, and also on the form of distribution. The maximum intake of cassava is about 100 g DM/kg W0.60 for dried ground cassava (Gomez, 1991; Régnier, 2011). 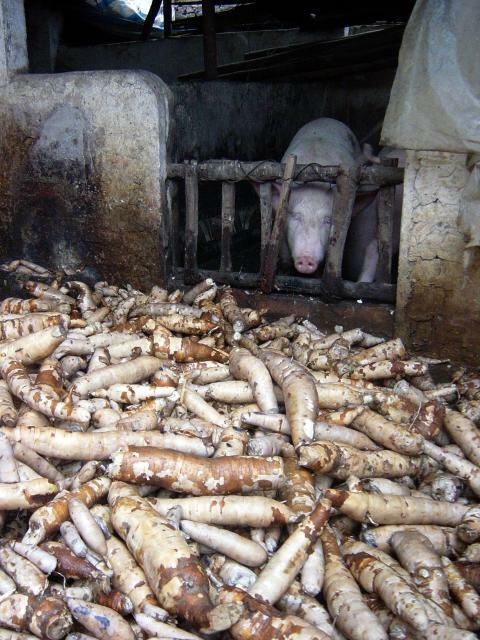 Cassava root meal is a palatable ingredient in the diets of young pigs (Göhl, 1982). The major concern in feeding cassava roots to pigs is the presence of HCN, especially in bitter cultivars. There is a negative relationship between HCN content and cassava root intake (Régnier, 2011). 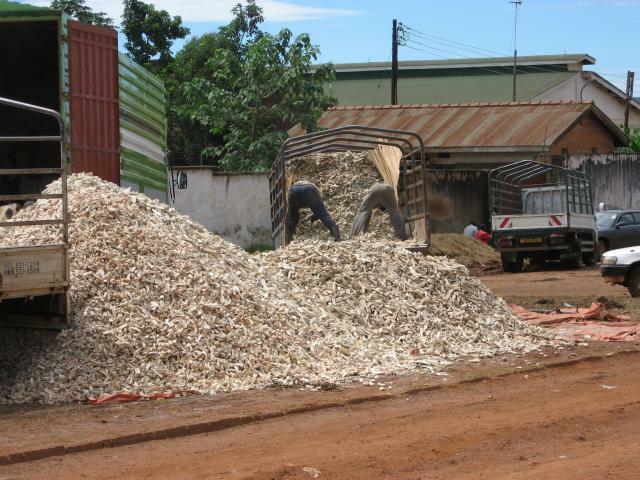 Dried cassava tubers can be efficiently used in poultry feeding. The problems related with cyanogenic compounds are overcome by the use of sweet varieties and/or proper post-harvest treatments as simple as sun-drying on a concrete floor (Gomez et al., 1983b; Chauynarong et al., 2009). Other processes such as boiling, autoclaving and fermentation have been found to be efficient but are unnecessary when sun-drying is sufficient. However, grinding cassava results in high levels of fine particles which can reduce feed intake and possibly irritate respiratory organs (Garcia et al., 1999). Pelleting reduces dust and increases the bulk density, favoring an increase in feed intake especially in young animals. The protein content of cassava is low, which requires correcting when formulating a diet. Particularly, sulphur-containing amino acids (methionine and cystine) have to be supplied in large amounts because they can be altered during the metabolization of HCN. The metabolizable energy value of good cassava meal (72% starch) is equivalent to that of maize (Sauvant et al., 2004). Lower quality cassava (less starch, more fibre) has lower ME values, and the ME of unpeeled cassava meal is reduced to about 85% that of maize (Agwunobi et al., 2000). Cassava tubers have also been used together with cassava foliage as a whole plant feed (Akinfala et al., 2002) (see the Cassava foliage datasheet). In well-formulated diets, good quality cassava can be used at high levels in broilers without reducing performance (Chauynarong et al., 2009, Daghir, 2008). For example the inclusion of 50% pelleted cassava results in performance comparable to that obtained with maize diets (Stevenson et al., 1983). With more than 30% unpelleted cassava meal in the diet, some authors report a reduction of feed intake, resulting in a non-significant decrease in growth while maintaining feed efficiency (Mafouo Ngandjou et al., 2011). Fine grinding (<1 mm) can decrease performance compared to coarse grinding (Mafouo Ngandjou et al., 2010). Feed consumption can be affected in young animals at high inclusion rates (50%) while older animals maintain their performance (Brum et al., 1990). Early reports of growth depression with cassava were probably due to high HCN levels or protein/amino acid deficiencies (Chauynarong et al., 2009). While there is no hard limit on the inclusion level of high-grade cassava in pelleted diets for grower-finisher broilers, the low protein content of cassava limits its inclusion to 30-40% to meet dietary requirements. When diets are fed in meal form, inclusion of cassava should not be higher than 20-30%, particularly in young animals (Buitrago et al., 2002a). Lesser grade cassava root products, such as dusty, unpeeled, or high-HCN roots or roots processed with little or no quality control, should be used more carefully, and the inclusion rate should not exceed 20% of the diet. High levels of cassava meal can be used in layer diets when the HCN level is low and the diet is balanced for protein and amino acids (Buitrago, 1990). Up to 50% cassava did not significantly decrease production, feed efficiency and body weight. 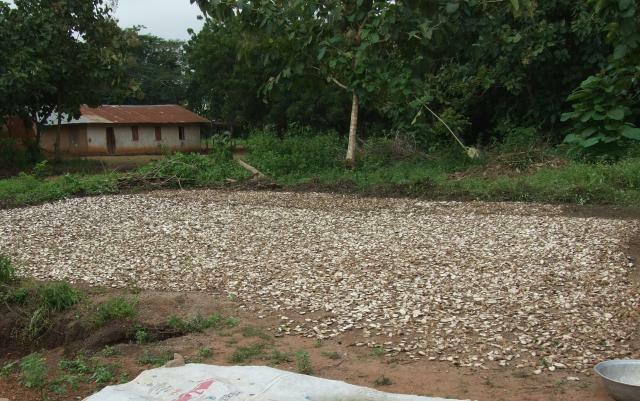 Water consumption increased when cassava was fed in meal form, while this effect was not observed with pelleting. 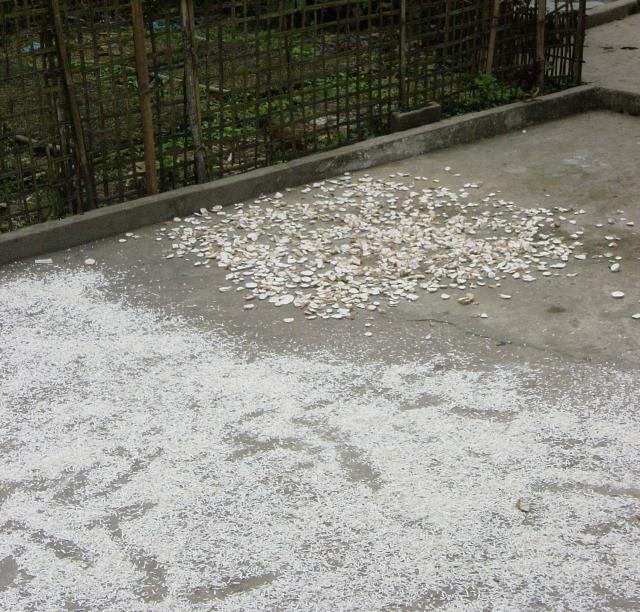 Egg mass produced was also improved by pelleting (Stevenson, 1984). Unpeeled cassava meal could be included at 30% in layers, completely replacing maize grain in the diet without adverse effects, including on egg quality (weight, shell, Haugh units, etc.) (Eruvbetine et al., 1997). However, the low carotenoid content of cassava requires supplementation with natural or synthetic sources of pigments if the egg yolk colour is to be maintained (Garcia et al., 1999). Good quality cassava meal can be used in layer diets without limit provided that the diet is properly balanced, especially with amino acids. As in broilers, lower quality cassava should not exceed 20-30% of the diet. When cassava meal was included at high levels (up to 45%) in geese diets, feed intake was maintained but performance and feed efficiency decreased (Sahle et al., 1992). While early research reported problems when including cassava in turkey diets (Göhl, 1982), no evidence of negative effects has since been found in scientific literature when correctly formulated diets are fed. Sun-dried cassava chips are used by traditional farmers in tropical countries such as Ghana (Mamattah, 1979), Tanzania (Mgheni, 1979), Uganda (Lukefahr, 1998) and Nigeria (Mailafia et al., 2010). Cassava roots slices are also a common ingredient for complete rabbit feeds in many tropical countries such as Cameroon (Fomunyam et al., 1984) or Vietnam (Doan Thi Gang et al., 2006). The inclusion level is generally 25 to 30% of the diet. Several studies have investigated the ability of sun-dried cassava root meal to replace cereal grains such as maize and barley, or other concentrate ingredients, in rabbit diets (Ikurior et al., 1998; Radwan et al., 1989). When experimental diets are correctly balanced, no differences are observed in growth or reproduction performance with inclusion levels up to 20-30%. Including cassava roots in the diet does not affect the quality of rabbit meat (physico-chemical composition and meat acceptability) (Omole et al., 1983; Onifade et al., 1993; Soliman, 1994; Oso et al., 2010). In experiments levels up to 45-50% have been tested without any adverse effects in growing rabbits (Radwan et al., 1989) or breeding does (Eshiett et al., 1980). The main issue when formulating balanced rabbit diets with cassava roots is their very low protein content, a problem that is usually addressed by increasing the proportion of soybean meal in the diet (Oke, 1978). However, cassava protein contains low levels of sulphur-containing amino acids, particularly methionine, which is required to eliminate the HCN released by bacterial activity in the digestive tract. Supplementary protein must supply sufficient methionine to achieve this. For instance, supplementing a diet containing 20% cassava meal and cassava leaf meal, also a low-methionine ingredient, for growing rabbits, resulted in a growth rate 17% lower than that obtained with the control diet (Abd-El-Baki et al., 1993). Thus, the use of cassava roots in rabbit feeding requires at least one source of sulphur-containing amino acids (more than 3.8% of the protein) such as maize bran, or pure DL-methionine. The total sulphur-containing amino acid content of the complete diet should never be lower than 3.7-3.8% of the dietary protein. The addition of palm oil (5%) seems to be an alternative way to reduce the negative influence of the cyanogenic glucosides (Omole et al., 1983). Supplemental oil delays the bacterial decomposition and therefore decreases HCN absorption (Tewe, 1992). Cassava roots, even when sliced and dried, have a mild goitrogenic effect, as evidenced by the low levels of serum thyroxin and cholesterol and by enlarged thyroid glands (Ratnakumar et al., 1992). However, rabbits fed a 25% cassava root diet had an increased growth rate compared to that of the control group, which indicates that the goitrogenic effect could be negligible in growing rabbits (Ratnakumar et al., 1992). Cassava roots have been tested in many fish species as an energy source. Digestibility and energy values of cassava chips reported in the literature for cassava are highly variable. Authors agree on the apparent protein digestibility (88-90%) but give different DM digestibility values (70% vs. 78%) and digestible energy values (6.7 vs. 13.2 MJ/kg DM) (Campeche et al., 2011; Pezzato et al., 2004). However, cassava flour, unsuitable for human consumption, was found to be highly digestible (91% for DM and 97% for protein) with a much higher digestible energy value than cassava chips (15.4 MJ/kg DM) (Boscolo et al., 2002a). Cassava root meal was found to be suitable for replacing 50% of white or yellow maize grain in the diets of young Nile tilapias (El-Baki et al., 1999). Another experiment concluded that discarded cassava flour could be used in the feeding of Nile tilapia fingerlings up to an inclusion level of 24%, wholly replacing maize grain without a decrease in performance (Boscolo et al., 2002b). It was possible to feed tilapias with mixtures of 76-80% fresh or sun-dried cassava leaves, 12-16% rice bran and 5% cassava roots (Chhay Ty et al., 2010). Cassava meal was found to be less palatable to tilapias than sunflower meal, maize grain, maize gluten meal and animal by-products, but more palatable than wheat, soybean meal and cottonseed meal (Pereira-da-Silva et al., 2000). In Clarias gariepinus fingerlings, replacement of 33 to 100% of maize grain by cassava flour resulted in a reduced performance (Akegbejo-Samsons, 1999). However, an economic analysis showed that cassava root meal could replace maize in the diet of hybrid African catfish Clarias gariepinus x Heterobranchus longifilis profitably up to 100% inclusion, with the optimal economic performance at 66% level of inclusion. HCN content increased with the level of cassava in the diet but was always within the tolerable range for the normal metabolism of the fish (Abu et al., 2010a; Abu et al., 2010b). In grass carp (Ctenopharyngodon idella) fingerlings, cassava meal could replace up to 100% maize grain (30% of the diet) with no detrimental effect on the final weight, final length, feed conversion ratio, condition index and survival rate (Lacerda et al., 2005). In common carp (Cyprinus carpio L.) a diet containing 47% cassava root meal has a slightly lower energy digestibility (87 vs. 90%) than diets containing maize or wheat starch. Growth and feed conversion efficiency were not influenced by starch source. The DM, fat and energy content in carp given cassava meal was significantly lower than that of carp given maize or wheat starch (Schwarz et al., 1993). In South American characids, black pacu (tambaqui), Colossoma macropomum and red pacu (Piaractus brachypomus), cassava root, plantain fruit and peach-palm fruit (Bactris gasipaes) gave a better growth performance than wheat bran and wheat middlings in diets containing 30% of the test ingredient (Lochmann et al., 2009). Sun-dried, ground cassava chips could be fed to Colossoma macropomum at 5% of body weight per day, together with commercial chicken feed given at 1% of body weight (Souza et al., 1998). Cassava meal can be totally substituted for wheat flour in extruded white shrimp (Litopenaeus vannamei) diets without any adverse effects on performance. It also improved the immunity development of the animals (Songluk et al., 2010). Feeding giant tiger prawns (Penaeus monodon) with the cooked meat of golden snails and cooked cassava chips (60:40 on fresh weight) yielded the highest net income, compared with maize alone, and helped address the problem of snail infestation in rice fields (Bombeo-Tuburan et al., 1995). Cassava meal could replace 100% of maize grain (51% of the total diet) in the diet of Malaysian prawns (Macrobrachium rosenbergii) without detrimental effects (Correira et al., 1996; Gomes et al., 1996). Dry matter, protein and energy digestibilities in that species are about 47-54%, 74-77% and 44-45% respectively, with heated cassava being slightly more digestible than dried cassava (Gomes et al., 1997). In the mud crab species Scylla paramamosain, cassava meal included at 30 or 45% in the diet reduced digestibility of DM, protein and energy compared to maize flour, rice bran and soybean meal and was therefore a less valuable ingredient (Phuong Ha Truong et al., 2009). A mixture of cassava flour and groundnut cake was used successfully to feed African giant land snails (Amubode et al., 1995). Abu, O. M. G. ; Sanni, L. O. ; Erondu, E. S. ; Akinrotimi, O. A., 2010. Economic viability of replacing maize with whole cassava root meal in the diet of hybrid cat-fish. Abu, O. M. G. ; Sanni, L. O. ; Erondu, E. S. ; Akinrotimi, O. A.
Buitrago, J. A. ; Gil Llanos, J. L. ; Patiño, B. O., 2002. Cassava in poultry nutrition. Cuadernos Avicolas 14, FENAVI-FONAV, Cali (Colombia). 44p. Buitrago, J. A., 1990. The use of cassava in animal feeding. Centro Internacional de Agricultura Tropical (CIAT), Cali (Colombia), 446 p.
Gomez, G. ; Valdivieso, M. ; Santos, J., 1988. Cassava whole root chips silage for growing finishing pigs. Nutr. Rep. Int., 37 (5): 1081-1092. Centro Internacional de Agricultura Tropical (CIAT), Cali, Colombia. Smith, O. B., 1988. A review of ruminant responses to cassava-based diets. In: Hahn, S. K.; Reynolds, L., Egbunike, G. N. (Eds). Cassava as livestock in Africa. Tudor, G. D. ; McGuigan, K. R. ; Norton, B. W., 1985. The effects of three protein sources on the growth and feed utilization of cattle fed cassava. J. Agric. Sci., 104: 11 - 18.